Frodo's Pad is a place to record and dialogue our ongoing journey of following Jesus. We are joining him in starting new churches in the neighborhoods of the Santa Clarita Valley in California. We believe that something good is emerging here that will extend God's Kingdom both near and far. I don't know what to say. It's been over 2 years since I last posted to frodospad on blogger. Welcome back me! You may have noticed a lack of recent posts here. Well that is for many reasons. One life has been crazy as we have been redooing floors & cabinets, etc. The other is that I have decided to move my online life & blog to mac.com. You can now read about our journey, see photos & video at the following address http://web.mac.com/frodo242/iWeb/Frodo242/Blog/Blog.html. I look forward to hearing from you about your thoughts on our new blog. Johnnie and crew are coming this afternoon to take out our old floors and replace them with beautiful Brazilian Cherry. We are very excited and blessed. Thank you AAA and Johnnie. The floors should be finished tomorrow...hopefully before the UCLA-USC game. Mimi and the girls are staying at Grammie & Papas tonight to avoid the cavern that will be our downstairs tonight. Last night I had the privilege of handing out candy canes and asking kids what they hoped I (St. Nick) would bring them for Christmas. In case your wondering why? Well, Starbucks holds a holiday party every year about this time and hands out free tall holiday drinks. We encourage our customers to come in and donate a toy for the Starlight Foundation....and gratefully many did. Sorry to all of you who missed the free drinks. Well as part of the party...I sat in a chair dressed as Santa and sweat and talked to kids for two hours. We gave each family a free photo of the occasion in a chrismas card. It was fun, but I was glad to get out of the suit and drink a couple of venti iced chais to cool me down. Yesterday I officially began my training as a shift supervisor. So far, so good. I kind of thought I knew what I needed to know. As it turns out, there's still a lot to learn. So back to school I go. But at least the pay is better. Through one of my coworkers, Alan, I have hired her fiancee, Johnny to replace our floors & refinish our cabinets. Johnnie is a great guy who happens to also be highly talented. We are still waiting for the videos of his exploits on Extreme Home Makeover, but we trust he knows what he's doing. In fact he is replacing our floors for less money than our insurance company AAA gave us to have them refinished. God's hand is definitely in this. It is also giving us great opportunity to have Johnnie and Alan in our home. Natalie & Becca love them and can't wait for them to come over again! Because I still hadn't finished a project from last November, I decided now was the time. We had redone our family room with paint, border, wainscoat, etc.... except for the area around our sliding glass door that I wanted to replace. Well, yesterday we bought a new door and it should get installed on Friday. Thank you Billy! This means that I can finish the wainscoat and when the floors get replaced next weekend, it will look like an entirely new home! This of course means that we will have to move into new rooms and make more and more changes....does it ever end? 14 months ago tomorrow I received a call from my friend Roger, telling me he wasn't going to be able to make our gathering. Why? He had just gotten off the phone with a social worker who was calling to see if he and Cynthia were interested in adopting a baby girl who was now 2 days old and needed to be picked up from the hospital by 5:00 pm in Glendale. This began a long and arduous journey that landed by Marissa in their home. A little more than one year later and Marissa is officially a Newton. What a precious little gift to Roger and Cynthia and to all of us. Last night we joined the Newtons and many of their friends in a wonderful celebration of Marissa's adoption and homecoming. There was joy, laughter and tons of photos. Like a bonehead, I didn't bring my camera, so here's a picture from Marissa's birthday party two months ago. I met with the adjuster yesterday and she has agreed to pay for our wood floors to be sanded and refinished. Fantastic! However, she is refusing any work to the cabinets or to remove the mold citing previous damage as her reason. This could be quite expensive for us to remove the mold....and yet leaving it or removing it ourselves is not really an option I plan on considering. 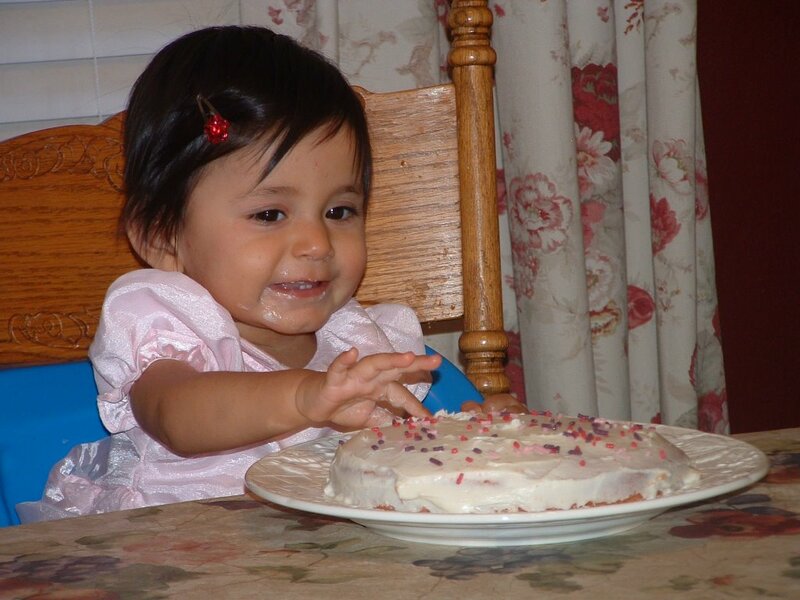 We can't have mold in our home especially with allergy issues & asthma for Mimi and Natalie. So we're going to try to see if we can negotiate anything else with the insurance company and if that doesn't work out, then we'll just have to bite the bullet. Fortunately I may have found someone to do the floor and cabinetry work that would be very reasonable. We have had the dehumidifier removed and so our kitchen is usable. The cupboards are still taped up because of the mold, but we can at least use the space and the noise level has decreased significantly. All of this to say our community242 gathering will be meeting at our house tomorrow. 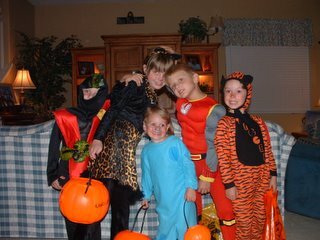 Our five trick-or-treaters sportin' their fashions on Oct. 31! Not quite the Lion, the Witch & the Wardrobe, but never-the-less we had an adventure. 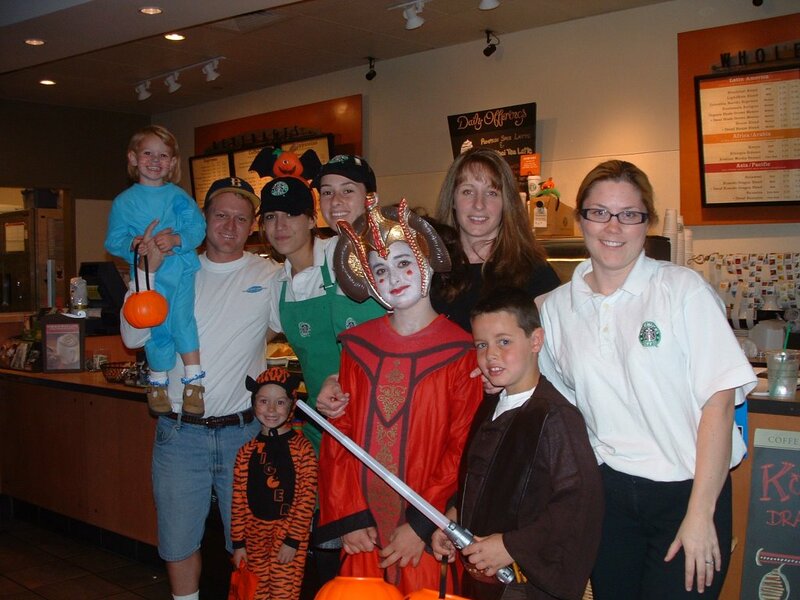 After stopping by a few homes on our street, we took the kids to Starbucks for trick-or-treating. We hooked up with Torrie, Christopher and Ashley for our tour of 6-8 shops. Also in the picture are fellow partners Heidi, Maggie & Erin. My friend Paul Kaak just let me know about a fantastic event for those of us interested in being & doing church organically. He and Neil Cole will be leading this weekend seminar Nov. 11-13 in LA. If anyone is interested in being part of it, email me. You can check it out at the www.cmaresources.org website. We can get a group discount if there are five of us. Right now I have 4 including me that are considering it. We have until Sunday to decide. In a flash Nathan aka the Red Power Ranger was gone. On his heals were Karissa and her neighbor friend dressed as a leopord and some kind of fairy. Hopelessly trying to keep up was Natalie dressed as Tigger. And lagging sometimes as far back as two or three houses, Becca (Blue from Blue's Clues) and Tyler (Ninja warrior) appeared to be quite content. It was fascinating to see the various paces that the kids all took on Halloween. We, the adults, tried a couple of times to help the situation by suggesting to those who were faster to wait for their siblings and cousins. That didn't work. For many, many houses I carried Becca to help her keep up. That was somewhat effective. But mostly we just let them go their own pace. In the end they all ended up with 3-5 lbs of teeth-rotting goodness. The very next morning I was having breakfast with a friend and author, Tim Smith. Tim was talking to me about how everyone has their own pace that they move through life at. He just published a book about this very thing, called, "Connecting with Your Kids." And he said that we never marry someone with our exact pace. Well that was certainly true of our Halloween experience and it has been true of our marriage as well. Due to the "Disarray in our Kitchen" we needed to move Com242's gathering to the Newton's home last night. It was good to be somewhere else for the night. This will probably be the last opportunity for us to gather at their home because they are moving out in less than two weeks from now. Ironically they are moving in with our neighbor next door Timmi, who has recently joined our community. She has been with us now for the past three Sundays. We were also joined by Joe & Kathy who are friends of Roger & Cynthia. We should have home emergencies more often. The food, family, fellowship was all fantastic! Thursday night while cleaning the kitchen I moved the mat in front of the sink only to find that it was wet underneath. I shrugged it off as the kids probably spilled some water and failed to wipe it up. Anyway, I pulled the mat away and dried the wood flooring with some towells. The next day about 4:00 p.m. I had just returned from work at Starbucks when I noticed the trash bag that lives under the sink was out. So I put it back. A few minutes later Mimi removed it again and informed me that the floorboard under the sink appeared to be wet. So I began investigating. What I found when I removed everything? Our water filtration system that was here when we moved in 7 years ago today, had been knocked over and was flooding the cabinets. There was a good inch of standing water in some places. We immediately stood up the water treatment system and began sopping up the water with a sponge and towells. Next I called AAA, our home owners insurance company and filed a claim over the phone. They sent an emergency team out on Saturday to begin the cleanup process. Well, there was mold in there...so they sealed our cabinets and set up a loud dehydration system. The large machine in my kitchen has been running non-stop now for over 48 hours. We have called both AAA and the company who brought the machine today but haven't had our calls returned. Hopefully before we leave to go Trick-or-Treating tonight we'll get some answers. We are not sure how big of a problem we are in for, but we are bracing ourselves. Our house is now almost 20 years old and it seems like things are starting to happen that indicate the house is 20 years old. Right now many of our neighbors are putting new roofs on their homes...ours has held up so far, but you never know what the next fix will be. I'll post more when I know more. Blue (from Blue's Clues), Tigger, a Cowgirl and I (Bono) all donned our appropriate attire and attended the Schoelen's annual Halloween Party. This was only the second time since Mimi and I have been married that we have dressed for Halloween. We were scrambling last minute to find costumes for us (MImi and me) and to relocate the ones we had for the kids. My costume was pretty much just me in black with some blue shades that were reminiscent of Bono's. Fortunately a few people were able to figure out who I was supposed to be. Others probably just thought I forgot to dress for the party. I had similar success dressing in the same clothes at Starbucks today. The party afforded the opportunity to connect and reconnect with several people on our support team and some we'd like to add potentially. It also gave us a chance to talk to more of Mark and Danielle's neighbors. We have now had three occassions I think over the past 10 months or so. We are simply trying to be faithful and walk through the doors that God opens for us. Among my favorite costumes of the night: Mark and Danielle as Pirates from Pirates of the Caribbean, John, Holly, and kids as the Incredibles family, and Joey and Tracey as Napolean Dynamite & his girlfriend. The highlight of the night for me was the final 7:03 of the UCLA-Stanford game which saw the Bruins come back from a 21 point deficit to tie the game 24-24. And then to win it with a touchdown in overtime. The Bruins are making a name for themselves as the Cardiac Kids...and it fits. 8-0 with three to go. They are now ranked 5th in the BCS with a showdown waiting in the wings with #1 ranked USC. One funny sidenote: Mimi left her purse in Danielle's closet....not the funny part yet. So last night she called and Mark agreed to bring it by Starbucks after his Bootcamp this morning. So here comes Mark walking into Starbucks with a bright pink purse with an "M" emblazed on the side. It was quite funny. He pulled it off beautifully. I asked him if the "M" was for Mark or for Mimi? He just laughed. Jane is an aspiring actress from New York who moved to L.A. to make it on TV and in film. She is Jewish by culture but told me Monday that she doesn't believe in God. Jane and I have spoken many times over the last several months. Her story is unfolding every time I talk to her. It was early on I discovered that she was in the process of divorce with the father of her daughter Lila, who happens to be an Arab Muslim. Jane, being Jewish and from New York, can be quite abrupt (no offense Brian). She has been known to get into shouting matches with her ex-husband on her cell phone in the middle of a rush at Starbucks. Drama and Jane seem to go together quite nicely. Monday was the first time Jane asked me about my faith. It was on my 10, so I didn't have much time, but I was able to share my confidence in Jesus. Jane is intrigued how I can be a pastor, father and husband, Starbucks barista and live in this community. The finances and the pictures in her head don't add up. I think she is also intrigued that I am a guy who isn't after anything with her. It seems from our conversations that Jane has had her share of heartaches. In the few months that I have known her she has had her heart broken by two different men and that doesn't include the one she is divorcing. Pray for Jane. She is searching for God, though I'm not sure she knows it yet. In her mind it is still about finding the right guy who will be good to her and her daughter. Probably 2 years ago or more I promised to build a window seat for Mimi. Well that promise was finally fulfilled yesterday. Thank you Eric for your help, design and expertise. It looks great. We still need to do the finish work on it, but it is well on its way. I'll post a picture of it as soon as we get it painted and the top cushion done. Saturday I had the opportunity to take in a great game at the Rose Bowl with a bunch of great guys. UCLA won big 51-28 and played their best overall game of the year. As long as they keep it up they should be undefeated when they face USC on the last game of the year. That will be a great showdown. I'll post some photos later. Thanks Mike, Dave, Linus, Linus Jr., Steve, and the gang. We should definitely do this again! And thanks Steve for being a good sport and hanging out longer so Dave would have a ride home. One of the amazing things about the Starbucks store I work at is the family-like atmosphere that we share as partners. I can't speak for other Starbucks, but we actually care for one another. It isn't unusual for our partners to hang out at the store off-duty every day for hours. In fact it is quite unusual to go more than an hour or two and not see an off-duty partner. Some come in a couple of times per day, much like our customers. Yesterday, I heard Vanessa say "Goodbye Nadia, I love you." Now that doesn't happen other places, does it? Especially when you consider Nadia has only worked here for a week or two. We have something special indeed. I believe a large part of it has to do with the church within our Starbucks. There are several people who walk with Jesus who work at our store and the love and affirmation are contagious. It is a beautiful thing! While sometimes you may hear a bit of gossip or disgruntling about this new partner and whatever challenge they've encountered recently for the most part we genuinely like each other and love the community that we share. Vanessa's last day with us is tomorrow. We are very sad to see her go...She is being promoted to shift-lead and will be going to another store a couple of miles away. She is sad and the rest of us are too. We know she will continue to come by, but it just won't be the same. Alana is also being promoted and sent to another store...Soon Erin and eventually me, too will be going elsewhere. Will the family stay in tact...only God knows. But I'm hoping with dispursement comes more opportunity to infect others with the power and presence of Jesus. Hey Amazon finally did their job and delivered my books! I have started two already...Revolution by George Barna and The Organic Church by Neil Cole. Both are excellent so far. I highly recommend them...especially if you are willing to think, look, act outside the proverbially church box. Let me know if any of you have comments about these or other revolutionary type books, articles, blogs out there. Another book that has transformed me over and over again is The Shaping of Things to Come by Frost & Hirsch. This one is worth a read or two. Saturday marked a day that looked as if both UCLA & USC would be beaten for the first time this season. Thanks to a couple of amazing comebacks, that had them tying the game with 44 ticks left (UCLA) and winning it in regulation with 3 seconds left (USC) that was not the case. Next week I have the privilege of going to UCLA's homecoming game against Oregon State with some friends from CA. We are still hoping for a showdown USC & UCLA on December 3rd. Hopefully they will both be undefeated still. UCLA was down by 17 at the start of the 4th Quarter but rallied to tie and then win it in overtime with a Maurice Drew 1 yard touchdown run. USC in what is being called the game of the year were down to 4th and 9 on their own 26 with just two minutes remaining. They completed a 61 yard pass from Leinert to Jarrett and continued down the field. Leinart then twisted and turned and barely made it into the end zone just in time. Football is back in Socal. Saturday night we were invited by Warren & Connie Schu to join them at their table for the Grand Tour, which is Christian Associates very cool fundraising event at the Reagan Library in Simi Valley. The event brought friends from all over Europe who are missionaries as well as many people we have known for years throught Calvary Community Church and elsewhere. We had a great time, especially connecting with our friends from the other side of the pond. You know who you are. "A focus on the church service as connecting point perpetuates the idea that following Jesus is about going to church. The community's life takes the form of American congregational religion rather than the fluid practices of the gospel, and this emphasis presents quite a barrier to the 'seeker' outside, as they need to be converted to the values of American religious congregationalism before they can come to faith. Thus, virtually all of those who are attracted to the relevant service were raised in church or are currently going to another church -- they are not the never-churched. In contrast, a missional congregation connects with those outside the faith by, well, connecting with those outside of the community in their world. Connecting happens not in a 'come to us' CHURCH service, but through 'go and dwell' church SERVICE, i.e. service in the community -- living alternative lives." Ryan Bolger from Bolgblog just posted this. It was too good to pass up! Thanks Ryan! I just received a question from an associate that asked how to start a service to attract people from outside the church. I encouraged her to give up on this idea. But what could possibly be wrong with starting a relevant church service directed to spiritual seekers? Relevant churches are rarely even closely relevant. Most Christians don't even like them. They might be better than Mom and Dad's morning service, but they usually are quite irrelevant to the outsider. The church person cannot 'guess' what the seeker wants, undoubtedly getting it wrong. What Christians need to do is create meaningful worship through bringing their very own lives to God. Worship must reflect the culture of the community that is currently part of the church, not replicate current worship CDs, nor 1980s soft rock, nor 18th century hymns. Instead of mimicking other church cultures, the community collectively brings their own idiosyncratic ways of life to God, whatever they may be. Indeed, the church may have the stray outsider finding themselves in the worship service and joining the community. But if the focus is on them, simply to be relevant, their worship will satisfy neither the church members nor the outsider. A focus on the church service as connecting point perpetuates the idea that following Jesus is about going to church. The community's life takes the form of American congregational religion rather than the fluid practices of the gospel, and this emphasis presents quite a barrier to the 'seeker' outside, as they need to be converted to the values of American religious congregationalism before they can come to faith. Thus, virtually all of those who are attracted to the relevant service were raised in church or are currently going to another church -- they are not the never-churched. In contrast, a missional congregation connects with those outside the faith by, well, connecting with those outside of the community in their world. Connecting happens not in a 'come to us' CHURCH service, but through 'go and dwell' church SERVICE, i.e. service in the community -- living alternative lives. A focus on the service as connecting point perpetuates the sacred/secular split of modernity. When the bulk of the community's energy goes to maintaining a church service, it implies that the church service is more holy, more important, more worthy of our time than the everyday practice of our spirituality. A focus on the service as connecting point perpetuates the clergy/laity split -- there are those who 'do' ministry, and then there is everyone else. Instead, the role of the leaders is to facilitate the worship expression of the community as a whole. What are the alternatives to connecting through the church service? To clarify, those who desire to connect with the outsider are in synch with the God of the universe. Truly, mission lies at the very heart of God. However, those of us raised in the evangelical tradition have been socialized into thinking that this connection needs to happen through a church service. The worship service is no longer an evangelistic service for outsiders but a space to practice heaven for a period of time, facilitating the offering of the community life to God in worship. If a guest of the community finds God in the service, all the better, but this is not the focus. Mission happens in the 'world', in the world formerly known as secular, on their 'turf' -- not ours. As servants, the Christian connects with the seeker through service in their world.